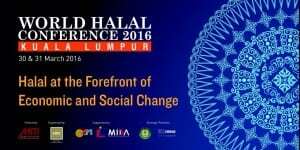 Kuala Lumpur, 30th March 2016 – In conjunction with the World Halal Conference, the Halal Industry Development Corporation (HDC) participated in a Memorandum of Understanding (MOU) with Nestlé (Malaysia) Berhad. The MoU seeks to empower local SMEs to compete and create a stronger presence in the global Halal market, as well as to further promote Halal Malaysian products and to facilitate and develop greater enterprise development in the Halal Sector. The ceremony saw an exchange of documents between Chief Executive Officer of HDC, Dato’ Seri Jamil Bidin and Managing Director of Nestlé (Malaysia) Berhad, Mr. Alois Hofbauer. This was witnessed by the Chairman of HDC, Tan Sri Dr. Syed Jalaluddin and Ministry of International Trade and Industry Minister, Dato’ Sri Mustapa Mohamed. Nestlé Malaysia is recognised as the Nestlé Group’s Halal Centre of Excellence, providing policy guidelines, know-how and expertise on Halal to other Nestlé markets. As pioneers of the Halal standard for the Nestlé Group, Nestlé Malaysia was the forefront company to be certified Halal in Malaysia when the Government introduced the Halal certification in 1994. As firm believers in the importance of multi-stakeholder partnerships, Nestlé Malaysia, HDC and SMECorp established the ongoing SME Mentoring Workshop in August 2009. The programme is a capacity-building initiative aimed at sharing Nestlé’s knowledge and world-class best practices in Halal management, production, sales and marketing to local SMEs in the halal F&B industry. The workshop provides participating SMEs with valuable insights on Halal best practices, in order to build up their capabilities and enable them to understand and meet the requirements of multi-national companies. To date, 343 SME companies in Malaysia have undergone the training. Through this MOU, HDC will support Nestlé in building up local productive capacity, enhance social inclusion, and promote environmental sustainability. Other initiatives include enhancing compliance with international norms; strategising the development of Halal industry in the promoted sectors, and to also strengthen Malaysia’s positioning and leadership in Halal Industry.